With April being Prevention of Animal Cruelty Month, We at Raise Ur Paw, are hoping that individuals will unite in support to raise awareness of animal cruelty/abuse. This year 2016, we are aiming our efforts higher, and anticipate a larger number of support in raising awareness against the inhumanity and cruelty that our innocent voiceless endure & face on a daily basis. Not only will we be once again doing our Prevention of Animal Cruelty Awareness ribbon campaign, but we have also included our #LetsGoOrange Prevention of Animal Cruelty Challenge. 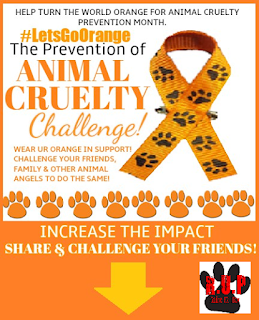 The Prevention of Animal Cruelty Challenge is the involvement of individuals worldwide – which consists of participants to wear orange and make a stand for the innocent in promotion of awareness of this plague that is destroying and even taking innocent lives every day. Participants are requested to either take a picture, a video or any other supportive method wearing their orange proud, along with the use of the hashtag #LetsGoOrange. We all have the power to educate, encourage, and empower others to become aware of the issues at hand and join in the fight to bring an end to this inhumanity. The challenge is to encourage and nominate individuals to involve themselves along with countless others to make the world orange. Please Take part in this challenge, and challenge your friends, family and other individuals – Together United We Can Make A Difference – But That Difference Starts With You. Or make a donation or volunteer time to a shelter, humane society or sanctuary in your area.